When we think of lifeguards, we may immediately flash back to summers at the pool with the teenager in a red suit. Often teenagers train and work as lifeguards because they would rather be at the pool than at the burger joint—it pays about the same in many places. But lifeguarding is a profession, the “on scene” responder. These water rescue experts not only are strong swimmers, but they have mastered the techniques to get a victim out of the water. Often they are diving in while a bystander calls 911. Amy Smith-Wexler is a professional lifeguard and Red Cross Instructor who trains over 300 lifeguards a year for New England Health and Safety Department. Amy spoke with At the Ready about the rewards, challenges, and perceptions of lifeguards while readying for the day’s mission as a pool lifeguard at an apartment complex. Massachusetts law requires every complex with over 200 units and a pool to employ a lifeguard, and today will be busy. "When there is no camp, school, or summer school, we have a full pool,” Amy says. Most summer lifeguard training takes place in May and June in New England, with July being “kick-off time” for most of the season’s lifeguarding. Lifeguarding, like every other responder profession, has levels of training and certification. Pool lifeguards qualify for training by meeting a timed 300-meter swim requirement, and then pass a rigorous course with written and practical exams. Waterfront lifeguards must pass a 500-meter timed event (under 11 minutes in Massachusetts) and complete a longer, more rigorous program. Treading water with your arms over your head? Yup. Treading water while holding a two-hundred pound victim? Yup. Backboarding a two-hundred-pound victim within 2-6 minutes in the water? Absolutely. After training and certification, the lifeguard has incredible responsibility—and liability—for everyone’s safety in the water. No longer will you find lifeguards only at the pool or at the beach. 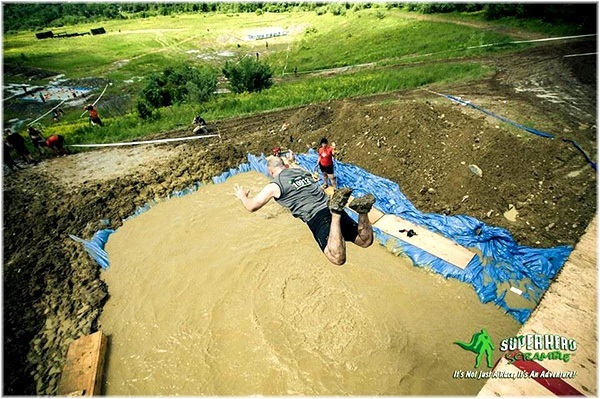 If you have competed in a “Tough Mudder” race, you have been protected by a lifeguard at every water feature. New obstacle course extreme races and events have driven the need for lifeguards as a critical rescue specialty. Picture a pit 10-14 feet deep and 15-30 feet wide, dug out with a backhoe. In her work as amphibious medic for STAT Medical and Amphibious Medics, Amy entered such a pit "about 15 times two weeks ago.” Triathlons at all distances have grown in popularity, and swimming is one third of the event. Lifeguards perched on surfboards watch closely to pull swimmers in distress onto the boards in open water. In reverse triathlons, swimming is last—after the run and the bike. After a four-mile run, Amy jokes, "many competitors still think they can swim.” Providing aquatics support for these events has become big business, with several companies competing for EMS contracts. As a result, more lifeguard jobs go unfilled due to a shortage of certified personnel. Since lifeguards are the “police of the pool,” some kids may blame them for spoiling their fun. Truth is, lifeguards often work alone, and are under tremendous stress to maintain constant vigilance. According to Amy, "90% of parents come to the pool and rely on the lifeguard to watch their kids and discipline them for hitting, dunking, or diving into the shallow end.” When an incident occurs, a single lifeguard may have to shout at a bystander to dial 911, and because a single lifeguard cannot properly backboard the victim, she must maintain c-spine, in the water alone, until other responders arrive. For this responsibility, many communities pay about $8.00 an hour to start. The profession carries a high turnover rate; many young lifeguards work only one season, causing a constant shortage. When training new guards, Amy makes sure her students understand the deep responsibility that comes with this job. "If someone drowns on their watch, it will affect them for the rest of their lives.” The perception is that lifeguarding is an easy, fun teen summer job, and everyone passes the course. A percentage of students do fail each cycle, and when they do, she routinely gets irate phone calls about how “anyone” can be a lifeguard. Meanwhile, photos and videos online portray the exception, of teen lifeguards texting or chatting on the phone, rather than performing a 10/10 scan or using other lifeguard techniques. Such rare complacency has led to tragedy.